It’s the iPhone’s battery life that gets attacked in Samsung’s newest TV ad for the Galaxy S5. 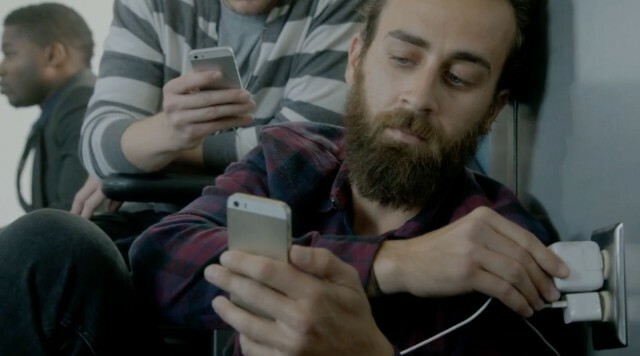 With the tagline “don’t be a wall hugger,” the ad depicts iPhone owners in desperate need of a charge at the airport. We’ve all been there, sadly. Galaxy S5 users walk about without a care in the world showing off the device’s powering saving mode (which basically makes it a dumb phone) and swappable battery. The ad itself is another attempt to make Samsung’s product look better than Apple’s by slinging mud, and it comes across just as petty as it did the last dozen times. The 5.1-inch S5 does have impressive battery life, but it’s also much larger than the current iPhone design. Apple is expected to introduce two larger iPhones this fall with the largest expected to be 5.5 inches. A bigger device means more room for the battery. Don’t expect Apple to do an interchangeable battery design, however. Guess Samsung wins that one.